Texans say everything is bigger and better in their state, and Houston Jewelry is no exception. Considered a state landmark of business, the store is owned and operated by the fifth generation of the Donsky-Solomon family, making their more than 160 years in business momentous and award winning. In 2008 Houston Jewelry proudly received the Texas Treasure Business Award. The award was created by the Texas State Legislature in 2005 to honor businesses that have been in existence in Texas for over 50 years. These businesses helped to create jobs, stimulate economic growth and have shown an unwavering commitment to the state and its people. Houston Jewelry meets those criteria and more. Their 160 year contribution to the state of Texas and its people is nothing short of amazing. The Donsky-Solomon family opened a general store in the mid-1850s on Main Street in Houston. The family grew the business, relocating several times before returning to Houston. Interior of Houston Wholesale Jewelers in 1953. On the right is Abe "Honey" Donsky, grandfather of Houston Jewelry's current owner, Rex Solomon, with his partner Dave Rubin. In the early 1930s, Nathan Donsky found himself in San Angelo, TX in the middle of the oil boom when he opened Nathan's Jewelers. As Nathan expanded he convinced his brother, Abe "Honey" Donsky, to close his beer business and join him in San Angelo. Donsky family legend has it that Abe was robbed by the infamous Bonnie and Clyde criminal duo while making a beer delivery. A few years later younger brother Ervin joined them to operate the Brownwood, Texas location of Nathan's Jewelers. After WWII Ervin went to Dallas with the backing of his family and opened the first catalog showroom in Texas - Sterling Wholesale Jewelers. Likewise, Abe opened Houston's first catalog showroom called Wholesale Jewelers. Eventually, the brothers reunited merging the Dallas and Houston operations. In 1992 Nathan Donsky died. At that time there were 35 family owners of the corporation, comprising three generations and three branches of family. There were four stores and over 800 employees. With the catalog showroom industry dying, the family decided to disperse the current business holdings and redevelop the real estate. Once the holdings were dissolved, two families expressed a desire to remain in the jewelry industry. Andrew Solomon, Dana Donsky Solomon, and Rex Solomon wanted to transform the Houston store into a high-end jewelry and fine gift store. Ervin Donsky and his son Howard wanted to do the same in Dallas. In 1993 both reopened their stores. Houston Jewelry's current 6,000 sq. 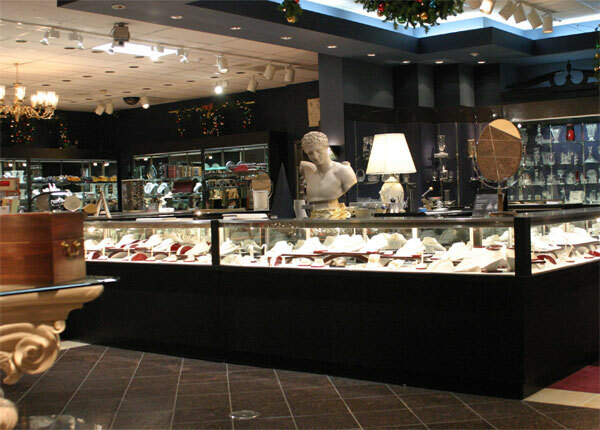 ft. location on Westheimer Road in Houston.Houston Jewelry has been located here since 1993 after transforming from a catalog showroom format, back into a traditional jewelry and fine gift store. Perhaps, the most impressive element of this family tale is the flexibility that each generation maintained to keep the business successful. Evolving from general store to an award-winning fine jewelry and gift store is impressive, but it is the diversions along the way that make the story so interesting. In the late 1990s Houston Jewelry opened an online division, www.1WeddingBand.com, which today is a major profit center for the company. Equally impressive is the ability of the family to maintain personal and business relationships. The successful transfer of a business once or twice is difficult, but passing a business down through five generations is remarkable. State Representative Beverly Woolley nominated Houston Jewelry for the award stating: "They have proven to be a successful business and a gem to the Houston community. Their commitment and contribution to Houston is commendable. I am honored to have a business with such a rich history and tradition located in my district." The Donsky-Solomon family's commitment to each other, to their business and to the state of Texas is unprecedented. "We are pleased that the State of Texas has chosen to honor the life's work of five generations of our family in the economic development of the state," said Rex Solomon, grandson of Abe "Honey" Donsky. Be sure to check out Houston Jewelry at their website, www.HoustonJewelry.com, or visit their Facebook page. The store also has some video posted on YouTube.